Photo courtesy of The Plank Center. 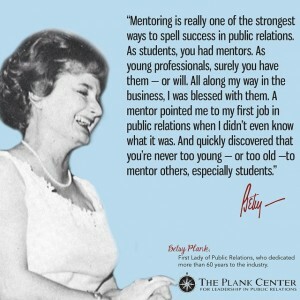 Having a mentor in the public relations industry is essential to success. 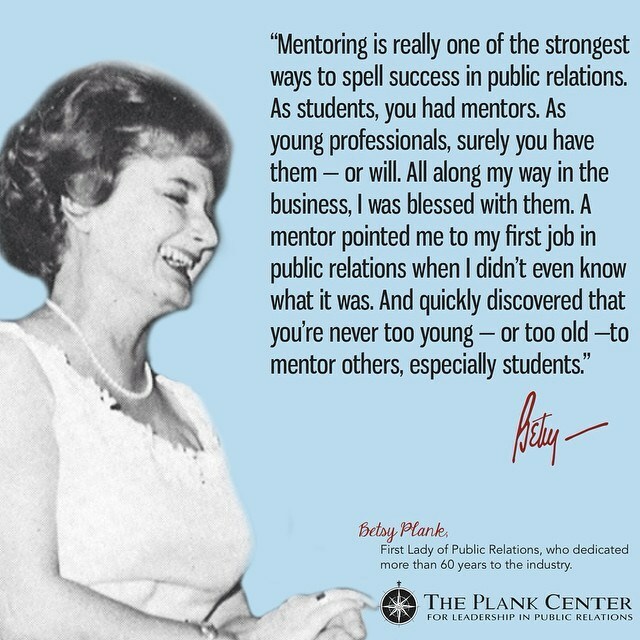 Having a mentor, and being a mentor, can also be one of the most rewarding professional and personal experiences. Mentorship presents an opportunity for personal growth and professional development, but how are these relationships formed? Where can you find mentorship opportunities? What should a mentor embody? What value does a mentorship hold? Finding a mentor can be intimidating. The key to finding and building that relationship is to not look for anyone specific, but to put yourself out there. The more opportunities you take to make connections, the more chances you get to spark a mentorship with someone you admire. A great starting point for students to look for a good mentor is within their PRSSA Chapter. Upperclassmen are a great mentor resource to consider. Not only are they in the same organization, but they have previous experience and solid connections. It’s important for mentors to lend advice when needed but also allow the mentee to make their own decisions. If you are the mentee in the relationship it’s important to be honest about the struggles you have. Don’t be afraid to ask questions and allow your mentor to challenge you to be better. Having a mentor, and being a mentor, is an opportunity to learn as a leader how to help someone become successful based on your guidance. In return, it’s also an opportunity to learn from someone who has been in your shoes. Take a chance and put yourself out there. Whether you’re searching for a mentor, or are asked to be a mentor, remember that it is a rewarding experience that will help both parties grow. A mentor in public relations professional helps you navigate the rough seas of the industry. There are so many unknowns in the professional world when you are a “newbie,” and a mentor can make a big difference. Kaley Consford is a junior at Texas State University and serves as the financial adviser for the public relations committee in the Texas State PRSSA Chapter. In her free time, Consford enjoys reading, hiking and watching “The Office.” Follow her on Twitter @KaleyConsford.